Nice lookin stripes there!!!!!!! Made it even better! Congrats! Is that your GTR in the background? I've seen a similar wrapped one in Seattle. 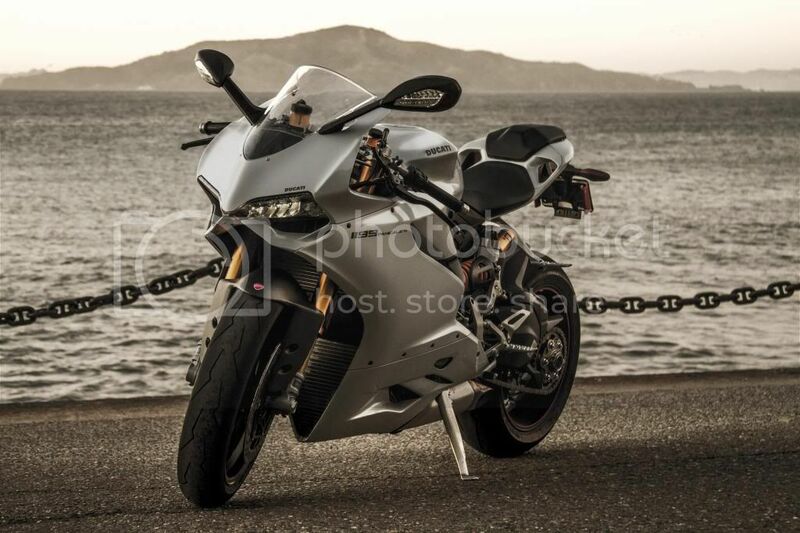 White pearl is like a total "Sleeper" Ducati Superbike, IMO. I Like. I got the white cause it wasn't red, so I got $400 off msrp. Besides things are faster when there white LOL. Someone pm'ed me and asked me to post up some pictures of my white Pani. I haven't had a chance to get any decent shots outside with a real camera, but here are a few I took in the garage with my phone. I'll try to get some of her next to her evil older sister over the weekend and post those. I just found some new inspiration. No one tell my wife. Awesome pics right under the Golden Gate!!!! !